Having good bait is everything when salmon fishing Great Lakes tributaries. To be successful you have to prepare the eggs right every time and have a variety. 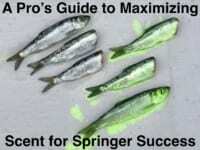 Even though many anglers still fish fresh eggs or uncured eggs variety is key. Our salmon switch off and on different colors throughout the day. And, while many believe you need a natural color egg that’s not the case. In fact, red and pink eggs have taken most of our fish this year. I stress variety. If you go to the river with pink, orange and red you can switch colors and sizes and give them something different all the time. You’ll hit a few fish on pink. Then you’ll stop getting bites and need to switch to red. Then natural, and orange. Even switching your skein sizes makes a big difference. I’ll start with big chunks and then switch to something small. Mixing it up is important. I’m going to great distances to ensure we have perfect eggs everyday. While it sounds complicated it’s not. 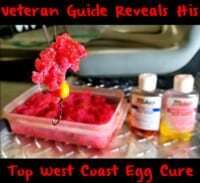 The curing process I use daily is simple, but we do use Fire Cure and BorX O Fire on every egg. Mixing them has been the ticket for Great Lakes salmon. Fire Cure penetrates the egg, brings amazing color and enables them to juice well. However, the BorX O Fire works wonders at drying out the egg for us and holding the egg cluster together. This gives us an egg that milks well and holds color. We can fish a chunk for 20 minutes sometimes if we don’t get a bite and the egg maintains its color. Step1: Take skeins, lay them on paper towel and butterfly them. Laying them on a paper towel removes excess and unwanted blood while also keeping dirt and other things out of them. Step 2: Add a generous layer of Fire Cure on both sides of the skein. It’s important to expose the Fire Cure to all of the skein. Step 3: Place eggs in Ziploc and let them cure for 24 hours. You’ll get your best results if you let them sit for that long. Step 4: Place the eggs back on the paper towels and add a layer of BorX O Fire on each side of the skein. Step 5: Then let them air dry for an hour on each side. This will make them tackier and enables them to last longer. Due to the reasons stated above I always have pink and red skein. Therefore I’ll match Pink Fire Cure with Pink BorX O Fire and Red Fire Cure with Red BorX O Fire. While orange hasn’t been my go-to color this season I still head to the river with orange eggs, which means I’m mixing Orange Fire Cure with Orange BorX O Fire. Sometimes when the water is really low and clear I’ll use Natural Fire Cure with Natural BorX O Fire. The combinations are simple and with them you’ll find better success on the water. Editor’s Note: Kyle McClelland is based in Northern Michigan and operates XXL Chrome Chasing. For more info on his guided Northern Michigan salmon trips please visit https://www.facebook.com/XxlChromeChasing.